President Rodrigo Duterte deploys troops and declares "state of lawlessness" after bomb detonated by Daesh affiliate group Abu Sayyaf kills 14 and injures 70 in Davao. A "state of lawlessness" was declared nationwide in the Philippines after Islamic extremists detonated a bomb that killed 14 people and wounded 70 in Davao, the home city of President Rodrigo Duterte. The President said the declaration of "lawlessness" did not amount to the imposition of martial law, but allowed for the deployment of troops to urban centers to support police patrols and set up checkpoints. "These are extraordinary times and I supposed that I’m authorized to allow the security forces of this country to do searches," Duterte said during a visit to the attack site. "We’re trying to cope with a crisis now. There is a crisis in this country involving drugs, extrajudicial killings and there seems to be an environment of lawless violence." 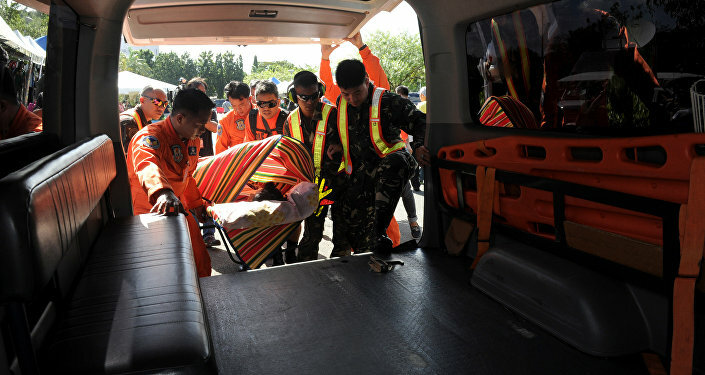 The attack on the city of Davao, home to 2 million residents, occurred as battle raged on amid a military offensive with Abu Sayyaf extremists in southern Sulu province – a conflict that intensified last week after militants kidnapped and beheaded a villager. The group immediately claimed responsibility for the last at a night market, but Duterte stated that investigators are still investigating additional leads including possible involvement by drug cartels. Refusing to level the blame solely at the feet of the Islamic militants may result in an expansion in the wave of extrajudicial killings by the Duterte regime of alleged drug cartel members – an effort that has led to widespread international condemnation. In the first two months of Duterte’s "law and order" presidency, over 2500 people have been killed in the war on drugs in less than eight weeks. The United States has already condemned Duterte’s violent war on drugs that has left thousands dead in a short period of time as counter to human rights norms and democratic practices opening a major diplomatic rift between the two longtime military allies and leaving the Filipino President to question whether to maintain a defense and security relationship with Washington or drift towards Beijing. In addition to the flurry of drug cartel violence, Islamic extremism has been a growing problem for the island nation in recent years – a claim made earlier in the US presidential cycle by Donald Trump that resulted in widespread mockery and laughter – led primarily by Abu Sayyaf. The organization, blacklisted by the United States and Philippines as a terrorist organization has been tied to a number of deadly bombings, ransom kidnappings and beheadings in recent years. The group pledged allegiance to Daesh (or ISIS), but any direct collaboration between Abu Sayyaf and Daesh has not yet been determined. It remains to be seen whether the declaration of lawlessness will see the imposition of hardline security policies by Duterte against Islamic militants in a manner similar to the bloody war on drugs or whether the Filipino president can clamp down on the 'environment of lawless violence" without a major increase in bloodshed.